Canada’s Charter of Rights provides the ultimate legal safety for its citizens: rights that include freedom of speech, religion, of association, and the right of citizens to enter and leave Canada. These rights are only of use, however, if the government respects them and accepts responsibility when it has betrayed them. Abousfian Abdelrazik, a Sudanese described as a religious healer, was accepted by Canada as a refugee in 1990; he married a Canadian woman, had a child, and became a citizen in 1995. By the late 1990s, however, he was swept up in the security establishment’s – CSIS and FBI’s – search for “Muslim terrorists” and faced harassment by both CSIS and the Montreal police. Abdelrazik returned to Sudan in 2003 to see his ailing mother, a trip that turned into a six-year nightmare. Canada’s treatment of him can only be described as vicious. 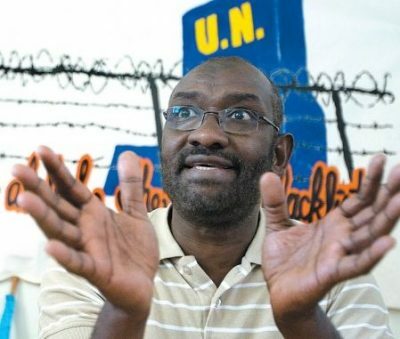 CSIS had Sudan arrest and imprison him in 2003, when he claims he was tortured. While Canadian consular staff claimed publicly that they were trying to help him, they were actually coordinating with CSIS and FBI interrogators. CSIS and FBI agents told Abdelrazik that he would never see Canada again, and that was clearly their intent, because when Sudan released him with no charges in 2004, Canada did not allow him to return. In brief: he was placed on the US no-fly list and, days later, the UN terror list, which froze his assets; these lists were then used as (bogus) reasons to ban his return; he was repeatedly refused emergency travel documents and when he was forced to raise money for a (subsequent) ticket to return home, his donors were threatened with charges of supporting terrorism! His epic struggle ended in 2009 with the ruling of a Federal judge that allowed him back. On his return in 2009, Abdelrazik filed a complaint about his treatment by CSIS as well as a $27 million civil lawsuit against the Canadian government (and a Minister) asking for an apology and compensation for its breach of his Charter rights. These challenges were in the public interest because they exposed significant problems in Canadian security oversight and in the use of secret evidence. Abdelrazik had never been charged with any crime and the RCMP cleared him of criminal activity. The “robust intelligence” that Jason Kenny had boasted about evaporated; CSIS’ tales about Abdelrazik’s supposed connections to al Qaeda, a criminal association with Adil Charkaoui (another CSIS victim), a bombing plot and the supposed discovery of RDX explosive in his car turned out to be fabrications for which no one would be held responsible. The CSIS response to Abdelrazik’s complaint was that no one was accountable; the CSIS Review Committee claimed that it didn’t know if it had jurisdiction! The complaint exposed the freewheeling operation of a security agency without clear legal limits or effective oversight. It also demonstrated, as in the Maher Arar case, the dangers to Canadians of CSIS coordination with the FBI; the US had tried to put Abdelrazik in Guantanamo, and his name remains on the American “terror list”. While Ralph Goodale, the Minister of Public Safety has offered further legislative safeguards, critics claim they remain woefully inadequate. While Stephen Harper‘s government stonewalled the compensation it owed the Canadian Muslim men who had been tortured abroad because of CSIS “mistakes”, Trudeau honored the Charter protections by several multi-million payouts in 2017. As might have been expected, the media whipped up Islamophobic howls of outrage at the compensation to the Muslim victims, adding traumatic insult to the real injuries they had suffered. The angry public response caused the Liberal government, on Sept. 18, 2018, to ask Federal Court Justice Martine St-Louis to postpone “indefinitely” the hearing to compensate Abdelrazik; she “reluctantly” agreed, but ordered monthly progress reports. To Abdelrazik’s lawyer, Paul Champ, this delay after nine years was “contemptible”. If the Canadian government is permitted to walk away from its horrific treatment of Abdelrazik, it can walk away from its violations of any Canadian’s rights. The media-induced outrage to the compensation ignored the root causes of the victims’ abuse: CSIS’ criminal incompetence and — more importantly — the use of secret evidence. Those who are accused (and typically their lawyers) face a Kafkaesque situation in which they have no way of knowing what the evidence against them is, and no way of refuting it. Predictably, security agencies support the use of secret evidence because it allows them to safely make or use career- enhancing misinterpretations of evidence knowing that the sources will never be identified or penalized. Citizens and taxpayers should be spurred to action by the travesty of justice that secret evidence encourages — as well as the high costs legitimately associated with it. Canadians must demand that the Liberal government honor its obligations under the Canadian Charter of Rights to compensate Abousfian Abdelrazik. At the same time, they must also demand an end to the use of secret evidence as well as more accountability from CSIS. Protecting Abdelrazik’s rights protects the rights of all Canadians. Karin Brothers is a freelance writer. She is a frequent contributor to Global Research.